Forward-looking indicators do not bode well for the first quarter either. The assessment of order books in manufacturing fell back significantly in December, while expected demand in the services sector also weakened. With export growth unlikely to accelerate much in the coming months, the first quarter is unlikely to see a significant pick-up, as demand from emerging countries, and especially from China, is not showing signs of recovery for the time being. While financing costs are still attractive (though credit spreads have been increasing throughout 2018), the decline in the profit share of non-financial corporations could be a harbinger of a more cautious investment stance in 2019. 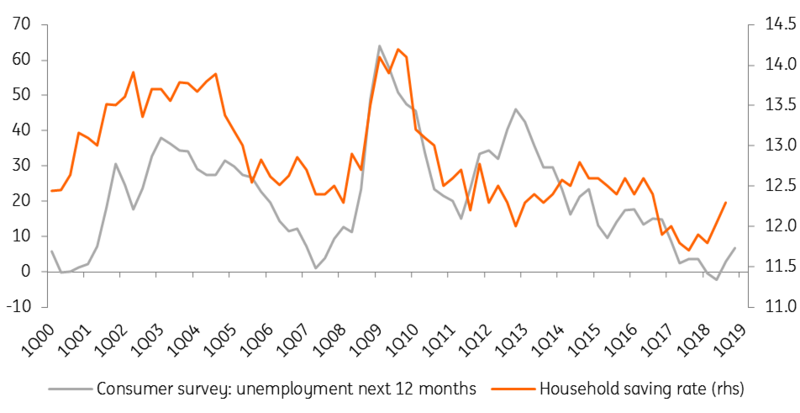 However, as an antidote against too much pessimism, there is still the labour market. In November, the unemployment rate shrank to 7.9%, the lowest level in a decade. As a consequence, wages growth is gaining traction. Combined with far lower energy prices, this should boost purchasing power and consumption in the first half of the year. On top of that, there is some fiscal loosening in the three biggest member states in the offing. The last retail sales figures showed a healthy 0.6% increase in November after an already strong October. But let’s not get carried away either. Consumer confidence has been falling lately. More specifically, there has been a significant increase in unemployment expectations since the summer months, which typically goes hand in hand with a rising saving rate. So, some of the increase in disposable income is not going to be translated into more consumption. Then there are potential political shocks. The Italian problem seems to be resolved for now as the Italian government and the European Commission reached a compromise, allowing for a budget deficit of 2.04% in 2019. The 'excessive deficit procedure' will be shelved for the time being, causing some relief on the Italian bond market, but that doesn’t mean that political risk within the eurozone has abated. Politicians are starting to prepare for the European Parliamentary elections, with Matteo Salvini seeking alliances within Europe to form a big eurosceptic block within the European Parliament. Admittedly, while this block will probably grow in importance, it would still be a minority. That said, the advent of more nationalist voices could make mainstream politicians more reluctant to pursue a policy of further European integration. That is troublesome since eurozone reform is far from completed, making a more significant economic downturn potentially an existential threat for the single currency. On the trade front, there is still the risk that President Trump would want to impose import tariffs on European cars (the US Commerce Department is expected to issue a report on the strategic character of the automobile sector for the US economy by 17 February). Lastly, the Brexit uncertainty hasn't gone away. 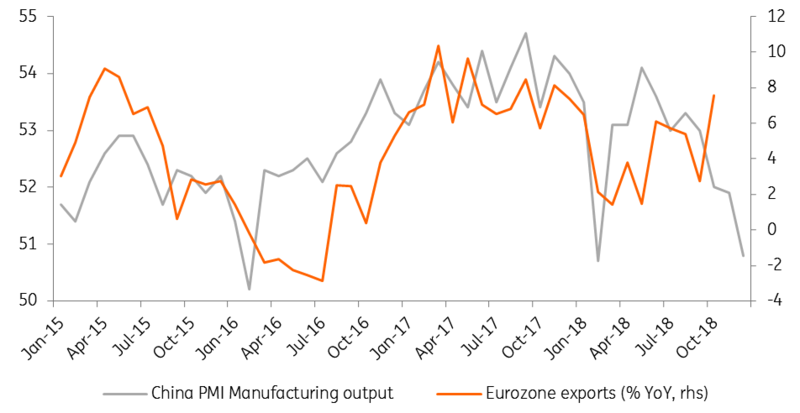 In the case of a hard Brexit, a temporary hit to exports to the UK seems unavoidable, something that could tilt the whole of the eurozone into a technical recession. Our base case doesn’t pencil in a hard Brexit, and we now think that the UK is almost certainly going to apply for an extension to the two-year Article 50 negotiating period, to get things sorted out. All in all, we continue to forecast 1.4% GDP growth in 2019 and 1.3% in 2020, but the risks are clearly tilted to the downside. It's hardly surprising we are convinced the ECB’s growth forecasts (1.7% for both 2019 and 2020) are far too optimistic. To be honest, there is already a feeling that members of the Governing Council are well aware of the rosy outlook as the minutes of the December meeting said: the balance of risks was moving to the downside, but the ECB refrained from going further than that. Inflation might also surprise to the downside. The strong fall in energy prices will have a downward impact on headline inflation in the coming months. And while higher wages could boost core inflation, we think tighter profit margins will partially neutralise this impact. 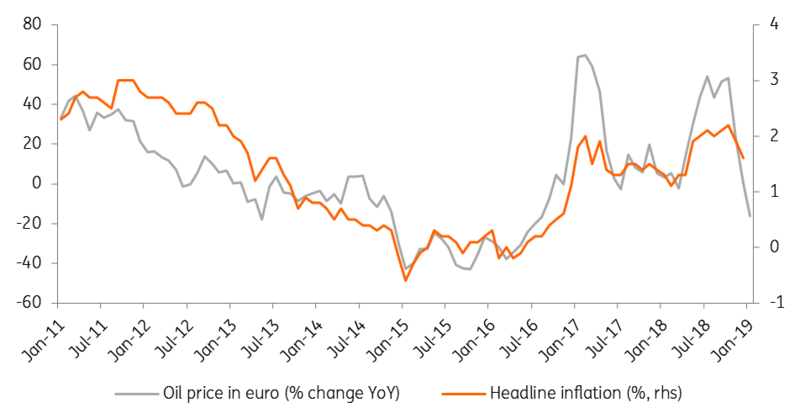 We simply cannot see how companies will be able to pass on higher costs to consumers in the wake of slowing demand and a still strong euro in effective terms. In these circumstances, we see little incentive for the ECB to tighten monetary policy. We still think there could be a small hike in the deposit rate, say 15 to 20 basis points, in the fourth quarter of 2019 to start shelving the second deflation-fighting policy instrument, but this is far from a given. In any case, we don’t see any refi rate hike over the forecast horizon. This essentially means that money market rates will probably remain negative throughout 2020; a reason why bond yields are unlikely to see strong upward pressure for some time to come. As the unwinding of the very cheap TLTRO funding might make bank credit more expensive over the coming years, there is a rising probability that the ECB will consider another round of long-term funding for the banks. In the minutes of the last meeting, suggestions were made to revisit the contribution of targeted longer-term refinancing operations to the monetary policy stance. When the ‘relevant committees’ are asked to study something, we know something is brewing.